Located at 1244 Baltimore Pike in Chadds Ford, PA Brandywine View Antiques is just one of those places you have to visit…three floors of fabulously cool antiques, vintage items, garden and home accents. 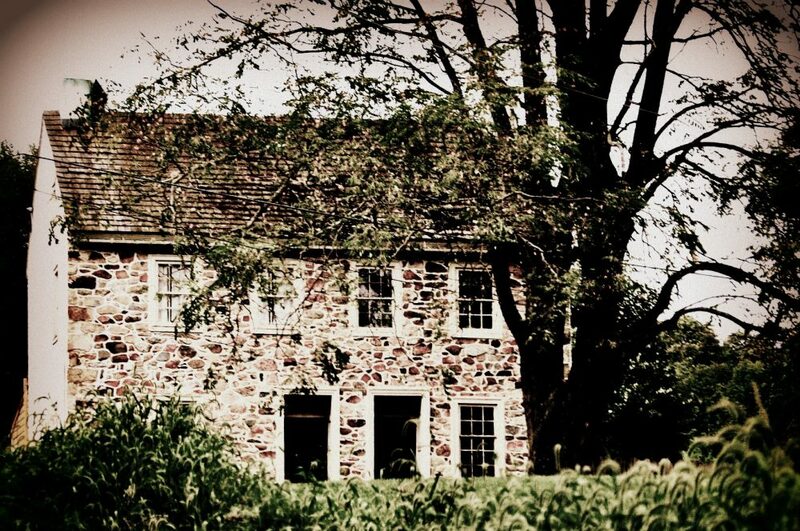 I used to go visit them in their old location near The Gables at Chadds Ford. I had visited them at places like Clover Market, and had been to their barn markets, but amazingly enough I hadn’t been to their new home until today. Lisa the owner has an amazing eye, and much like her old location, it’s a wonderland of stuff inside and out. But this new location is so terrific and the building is so much better and it has amazing flow. Of special interest to me today because I am a self-professed garden fanatic, was all the great stuff owner Lisa has to make your garden look fabulous. From vintage concrete benches and beautiful cast iron antique garden furniture to the perfect little fox or owl or angel or even gnome for your garden, there is a lot to choose from. Things I found of particular interest were cast concrete edging made to look old and these darling little concrete obelisks that you could put in your garden beds. They also have cast concrete leaves that are flat that you could use as stepping stones in a garden which I really liked and it almost made me wish I hadn’t already put down a stone path on one side of my garden! And gargoyles! I can’t forget their gargoyles which look like they just flew in from living on old Parisian rooftops! A nice selection of concrete birdbaths, architectural salvage, great old doors and windows… even in this heat I could’ve stayed a lot longer than I did. And when you go inside there are all sorts of wonderful antiques and vintage items for the interior of your home as well. They have the best selection of antique and vintage mirrors I have seen in a while, and some interesting and reasonably priced vintage art throughout the building. Anyway, it’s a feast for the eyes and visiting this business also gives you great ideas! I also love that there is so much diversity of merchandise. And I hate to say it but I’m really glad it’s not an antique store full of mid-century modern. And their pricing is quite reasonable, and if there something you wonder if they can do better on – just ask. If they can, they will if they can’t they’ll tell you. I love old school recipes. One from my childhood is Swedish meatballs. Not because we had any Swedish heritage – it was just one of those dishes my mother would make for us. Over the years I have tweaked a basic recipe to suit me. I also do something that I doubt anyone else does – I will prepare the meatball mix ahead of time the day I am cooking and refrigerate until it is time to make the meatballs. That allows the spices to meld and perfume the meat mixture better. Panko bread crumbs are superior to regular bread crumbs in my opinion, but the most important thing to remember is to use PLAIN breadcrumbs. This is not the recipe for flavored breadcrumbs. Some use mashed potatoes, I like wide egg noodles. I hope you enjoy my recipe if you try it. Watch the salt you add because of the sodium in most broths. In a medium sized bowl combine ground beef, panko, parsley, allspice, nutmeg, onion, garlic powder, white pepper, cumin, paprika, mustard powder, dash of buttermilk, salt and egg. Mix until combined. Put in refrigerator and chill a couple of I do this because meat mixture flavor deepens. Roll into 20 + small meatballs. In a large dutch oven heat olive oil and 2 Tablespoons butter. Add the meatballs and cook turning continuously until brown on each side and cooked throughout. Transfer to a plate and cover with foil. Add 4 Tablespoons butter and flour to skillet and whisk until it turns brown. Slowly stir in beef broth and milk. Add Worcestershire sauce and Dijon mustard and dill and bring to a simmer until sauce starts to thicken. Salt and pepper to taste. Add a small dash of nutmeg (I mean small!) and celery seed. Add the meatballs back to the skillet and simmer for another few minutes. Serve over egg noodles or as the Brits call it, a “good mash” or plain mashed potatoes. I prefer egg noodles. I have been remiss. I haven’t blogged any recipes lately. This evening for dinner we were grilling marinated chicken thighs and my neighbor had given me a beautiful head of purple cabbage so I decided to make coleslaw. I read somewhere once that purple cabbage is really good for you. A super food full of antibiotics, vitamins, fiber, and other good stuff. 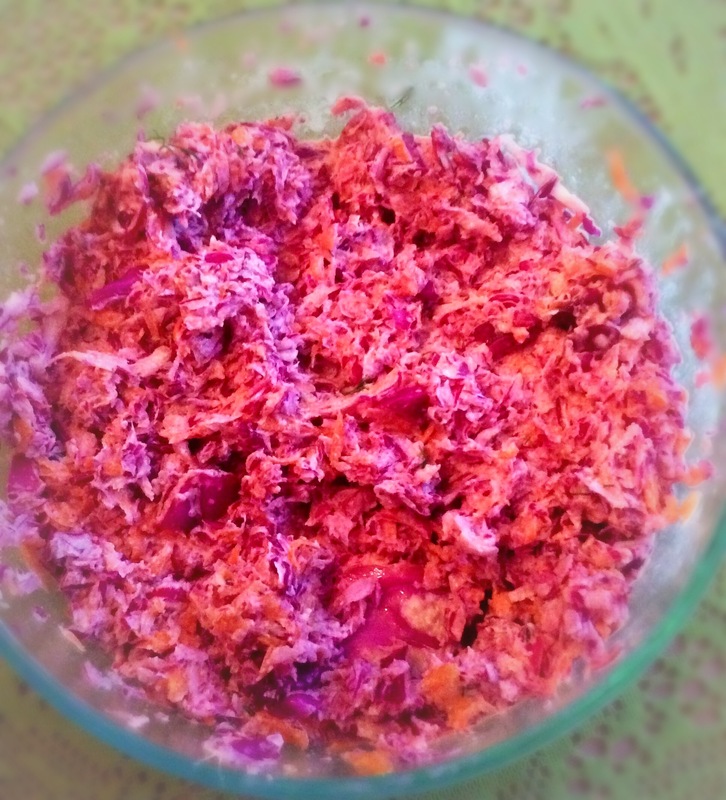 I think it also makes a tastier coleslaw. I also add vidalia onion to my coleslaw and fresh dill to the dressing, which I think keeps it fresh and different. First finely grate cabbage, carrots, and onion. My “Pro Tip” here is I put these vegetables into a fine mesh strainer after grating and set them over a bowl and press gently for some of the extra liquid to drain out. 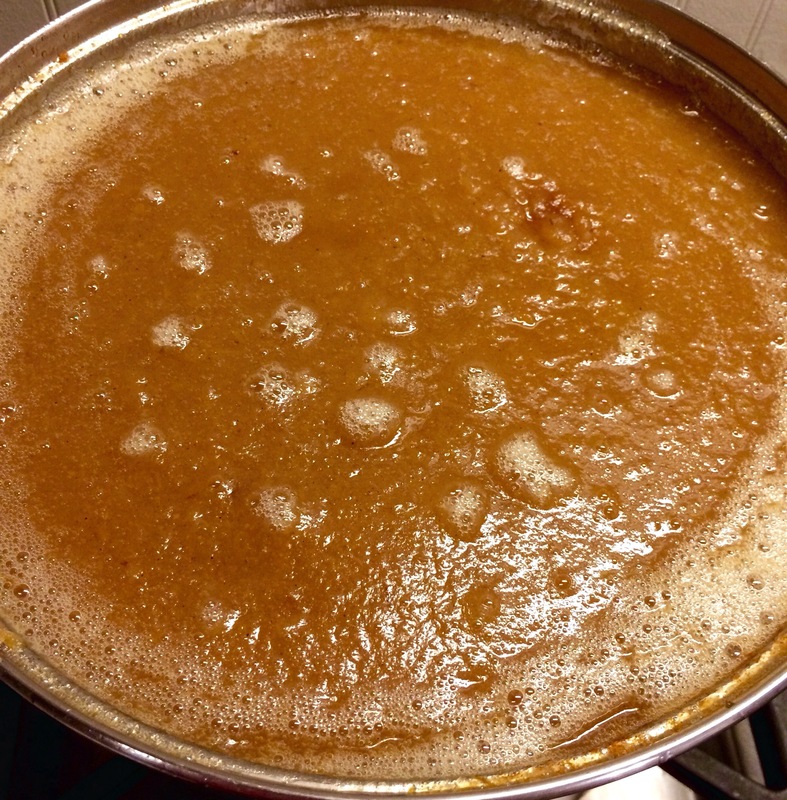 Mix the cider vinegar, sugar, cumin together. Unless you want a grainy dressing, make sure the sugar is fully dissolved before proceeding and adding the mayonnaise, dijon mustard, olive oil, and fresh dill. Whisk the dressing together briskly and refrigerate for a few minutes. Next put your veggies in a clean bowl and pour the dressing on top of it. Mix well and then use a little spoon to taste and adjust for salt and pepper as needed. I like fresh ground pepper in coleslaw. A friend of mine gave me a cache pot that belonged to her grandmother. 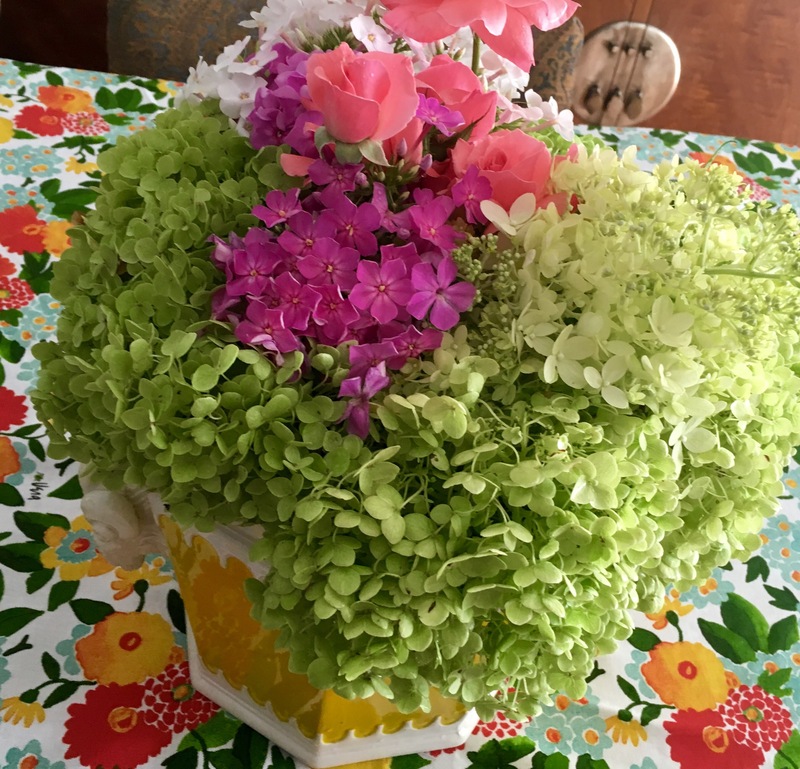 It’s a beautiful pot and it makes the perfect vehicle for summer flower arrangements. All of these flowers are out of my garden. This is why gardening is so worth it. With the help of Mother Nature you can create such simple beauty and enjoy the fruits of your labor. Becky Home Ecky has taken me over the past three weeks. I have been canning apple sauce, apple butter, pear butter, pickled watermelon rind with red onion, and garlicky bread and butter pickles with jalapeño peppers. 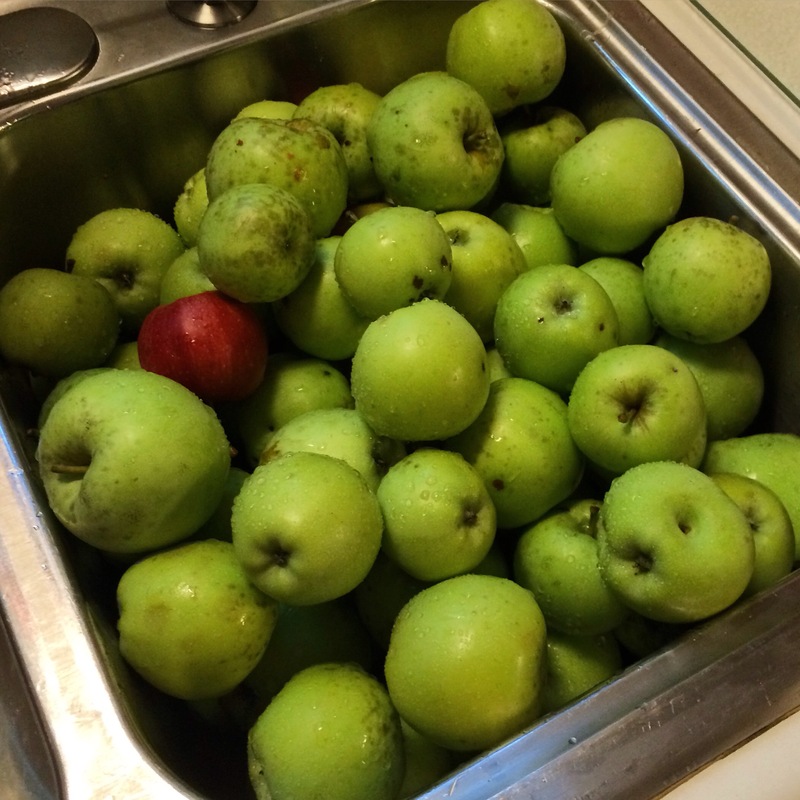 The apples and pears I picked myself out of the gardens of friends, and this year everyone seems to have a bumper crop of apples, especially. The recipes mostly came out of my head and memory of canners past but I used the Blue Chair Jam Cookbook, Simply Recipes, and Ball’s website for added direction on procedure and proportion. I have memories of my mother canning and making preserves and her mother, my grandmother, and my late cousin Suzy. My grandmother would pickle and preserveanything that stood still long enough, and she was an amazing cook. 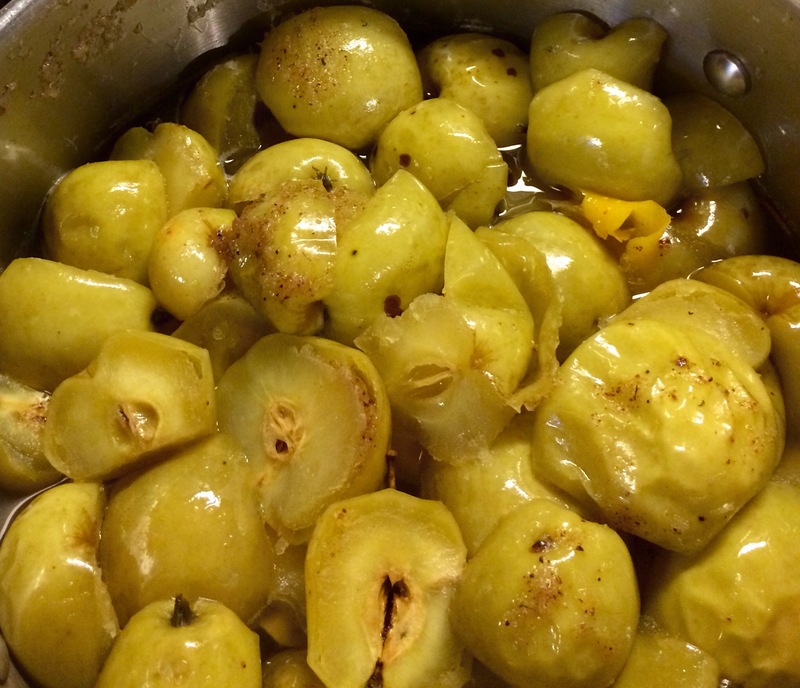 I remember my mother pickling okra and green tomatoes and I also remember her making peach preserves when my parents’ friend Charlie Peterson gave them a big bushel of peaches when I was little. 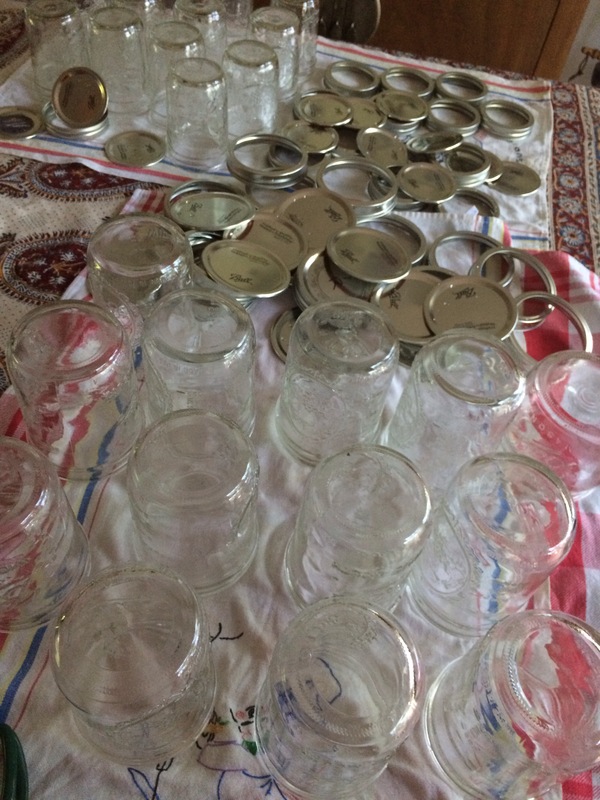 My mother’s German friends Susi and Babette were canning wizards. I remember all the things they made, pickled, and preserved. When you were in the kitchen of Babette’s farmhouse in the fall you could hear the sauerkraut popping in their stone crocks in the basement. And I also remember my great aunts on Ritner Street in South Philadehia doing a lot of canning too. They had essentially an extra kitchen in the basement and I remember them pickling and canning what came out of my Aunt Rose’s large kitchen garden in Collegeville. My Aunt Rose and Uncle Carl had this big old house with sweeping grounds that backed up to a farm when I was little. The farm had horses near some apple trees that would stick their heads over the fence looking for a pat (and some apples! )…my cousin sold the property after my aunt and uncle passed away and by that time (after 2000) where they once lived had stopped being country long ago, and was obscenely over developed. 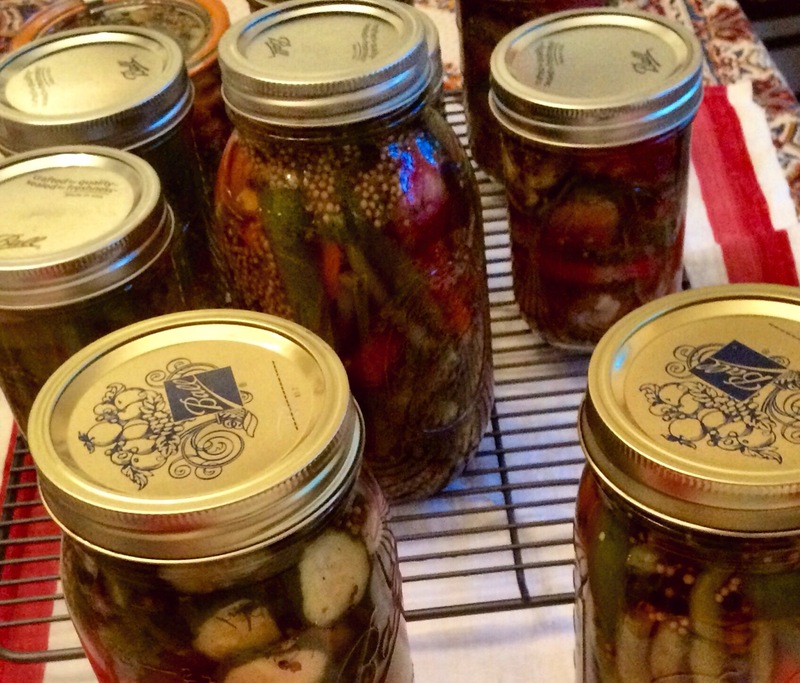 My great aunts would mostly can tomatoes and made these pickled hot peppers that would bring tears to your eyes. I remember the jars of canned tomatoes all lined up one after the other all in a row. It actually looked really pretty. 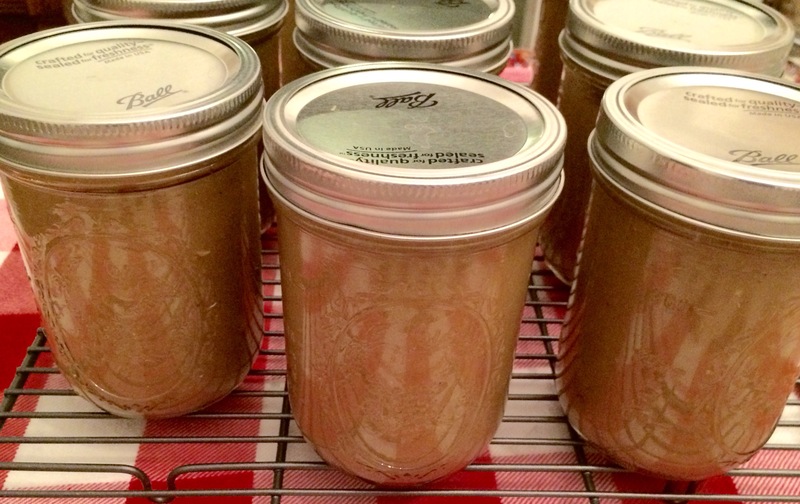 I had a lot of fun doing my canning with the exception of a minor kitchentastrophe. 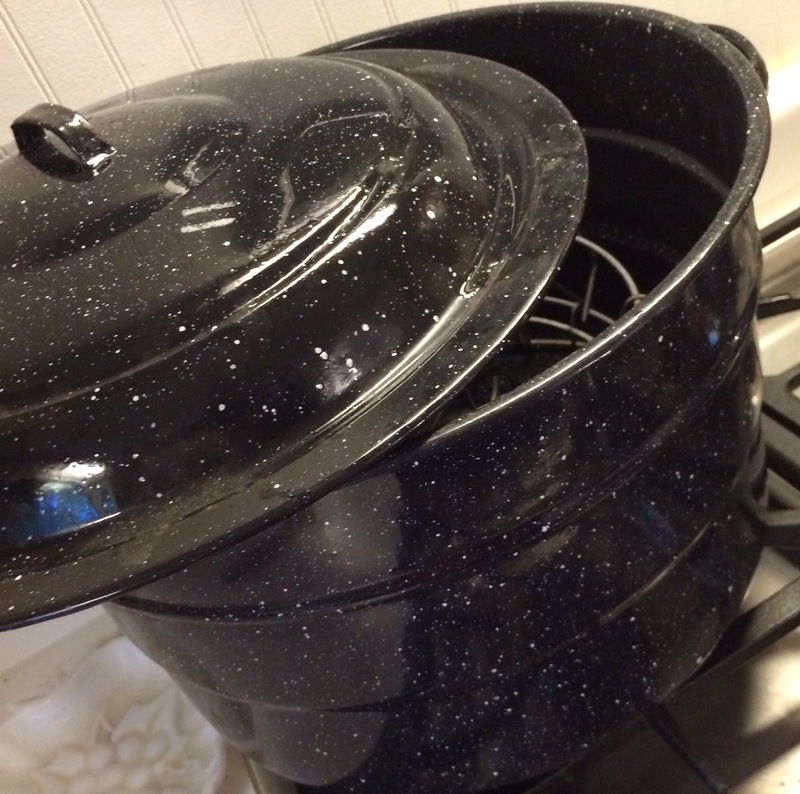 I singed my backsplash behind my stove top when my giant 21 quart enamel pot I use for the canning water bath was off center on its stove burner. My kitchen was filled with the smells of childhood. The vinegary garlic spice odors of making a pickling brine. 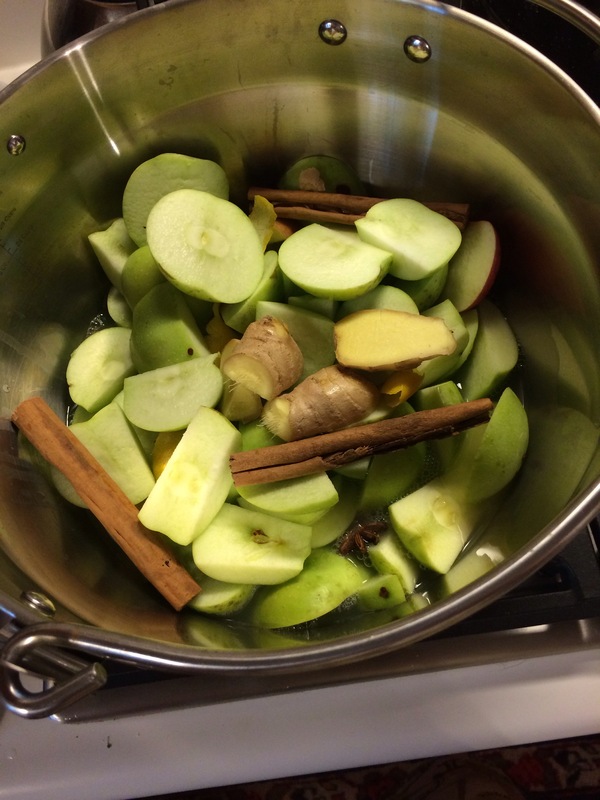 And the sweet smells of apples and pears cooking in cinnamon, cardamom, ginger, nutmeg, star anise, and turbinado sugar. They were wonderful smells and truly sensory memories. 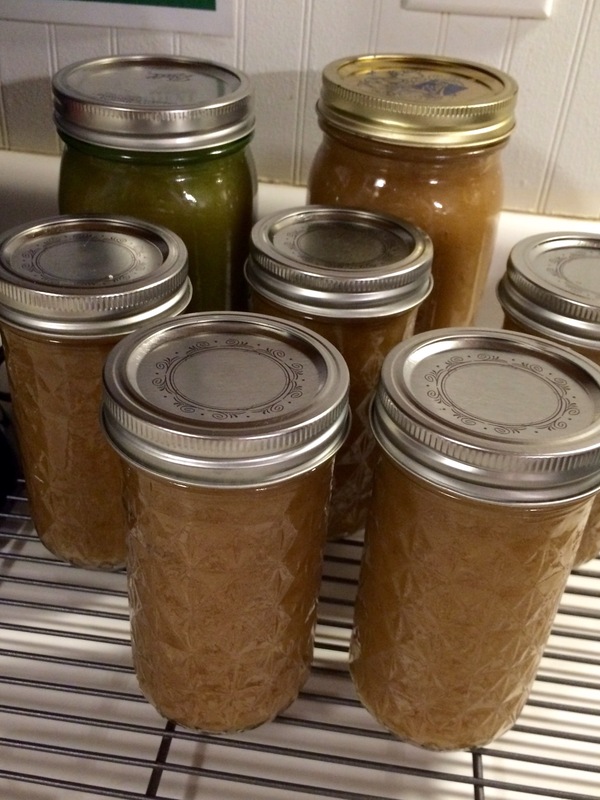 But last evening when I had finished placing my last batch of applesauce in the canning hot water bath, I was ready to be finished. 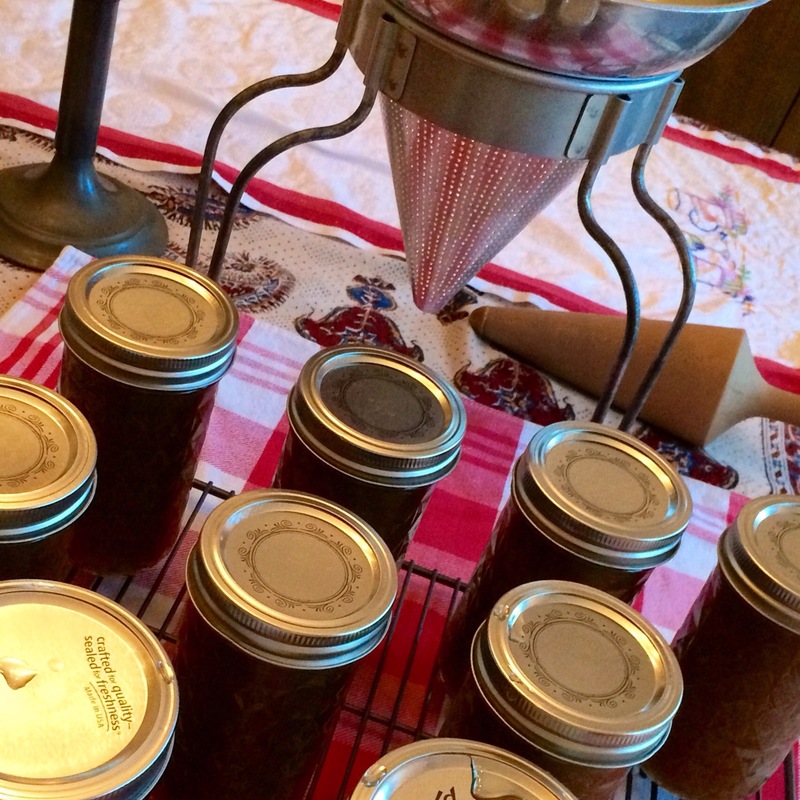 Canning is actually pretty hard work, even if it’s fun. Your arms ache by the time you finish pushing hot fruit through the chinois before the final cooking stage. It made me realize how hard women used to work putting up food for their families to last all winter long. A fun fact is canning dates back to the late 18th century France. Canning food in unbreakable tins was an English invention from the early 19th century. I am pretty much a novice at this culinary art form. I am not as nearly accomplished as some of my friends and neighbors. I am sure as I do more canning I will become more adept. So now all I have to do is finish labeling and dating my final couple of batches and put it away. 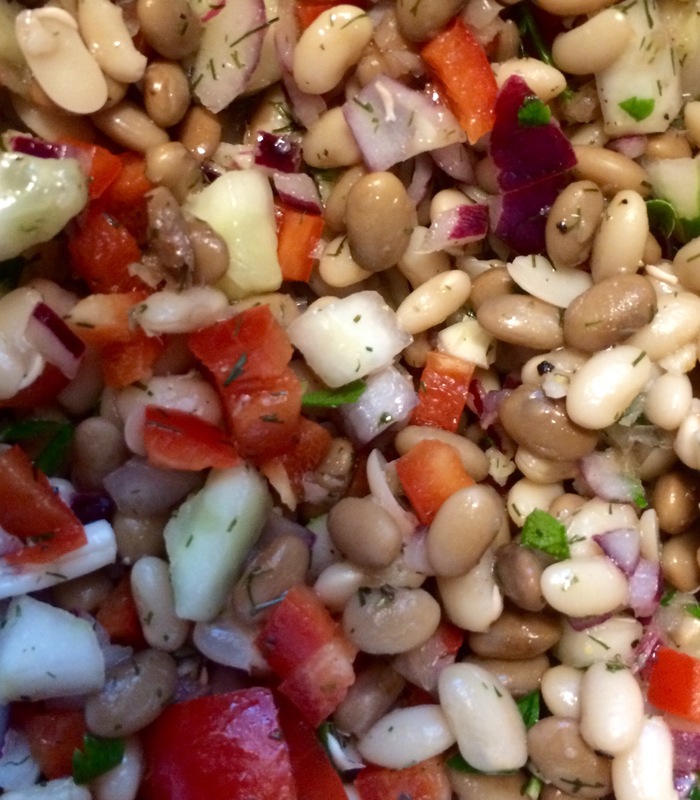 So bean salad is a summer staple. One bean, two bean, three bean and more. I decided to change it up. I took half a bag each of Goya dried navy beans and pinto beans yesterday and put them in to soak with salt and water overnight. I then cooked them according to directions on their packaging this morning. While the beans were cooling I minced three large cloves of garlic, chopped fine one large red onion, chopped one fresh red bell pepper, peeled and chopped one fresh cucumber, and tossed into a bowl. To that bowl I added salt and pepper to taste, 3 tablespoons of white table sugar , a bunch of fresh dill chopped, and a third of a cup of Italian flat leaf parsley chopped. I mixed the salt and pepper, herbs and spices, along with the vegetables and drizzled olive oil and rice wine vinegar and red wine vinegar over the top of it and stirred some more. I always add more vinegar than oil to bean salads. I should’ve measured exactly how much oil and vinegar but I didn’t I’m sorry- you want basically enough that your salad gets coated and sort of pickled but not enough that it swimming in dressing. Last but not least I tossed in the beans which I had drained and mixed everything together, as well as adjusted for salt and pepper. I will now chill the salad down until this evening but it looks beautiful and tastes terrific!